Good Time Charters > Captain’s Blog > Uncategorized > Looking for something to do on Fort Myers Beach? 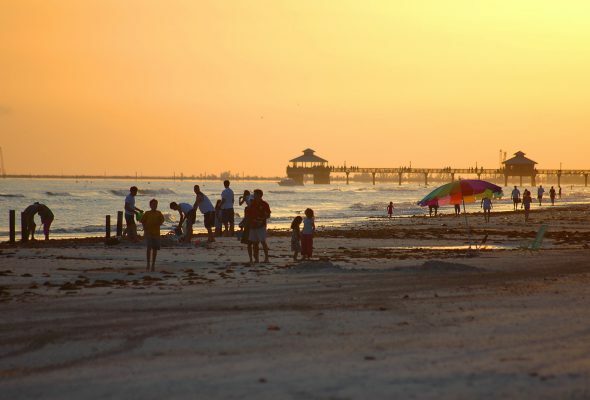 Looking for something to do on Fort Myers Beach? Sand, sun, and warmth…. now what? You’ve arrived in one of the most beautiful destinations in Florida, it’s time to take advantage of the beautiful landscapes, and the wildlife that calls Southwest Florida home. Join us on a comprehensive eco tour, we guarantee that you’ll enjoy your experience! Meet other explorers and our expert guides, and begin your journey on the waters of Estero Bay as you cruise, fish, sightsee, and/or look for sea shells. At Good Time Charters, we offer a variety of “real Florida” outdoor experiences including kayaking, fishing, boating, sunset cruises, and more! Enjoy the scenes as you pass through our coastal estuaries that are teeming with life, embraced by stunning sunsets that occur predictably every single night.Soak up the sights of local mangrove habitats and their natural beauty! The best fishing charter on Fort Myers Beach is found with the captains at Good Time Charters. Choose from a morning half-day or an afternoon half-day with the talented local fisherman from Good Time Charters. You’ll be pulling up snook, redfish, grouper and snapper before you know it! Click here to book your charter! Not into fishing? Join us on a guided kayak tour. Glide over the calm waters with just the wind in your hair and the sun on your skin with absolutely no noise or distractions. At Good Time Charters, our marine biologist offers a kayaking eco tour on Fridays at 10:30AM. If you really want more insight into the ecosystem, this is the tour for you. Kick back, relax, and soak up the natural ambiance of Fort Myers Beach. Perfect for those looking to get a glimpse of Fort Myers Beach, her surrounding islands and plenty of playful dolphins, join the experienced guides at Good Time Charters for a Fort Myers Beach dolphin cruise. For a full list of all available tours, click here.